As an incoming freshman at the University of Louisiana at Lafayette, Alice Costa Alegra faced a formidable challenge. The Angola, Africa native did not speak English. 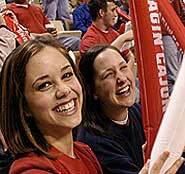 She spent her first year at UL Lafayette in the university’s Intensive English Program, mastering the language in six, eight-week sessions. This fall, she will begin tackling the petroleum engineering curriculum. Monday evening, Alegra attended a first-ever reception to welcome new international students to Lafayette. The event, held at the Lafayette Consolidated Government administrative building, was sponsored by LCG and UL Lafayette. More than 50 of the 80 incoming international UL Lafayette students mingled with government officials, university faculty and staff, and community leaders. Alegra said she wanted to offer support to new international students. “Attending school abroad is an immense challenge, but UL Lafayette provides a very supportive environment for international students,” she said. UL Lafayette President Dr. Joseph Savoie said international students contribute to the community’s economy and help to “broaden the educational experience” of all students. Representatives from Le Centre International de Lafayette, Lafayette Convention and Visitors Commission, Lafayette Economic Development Authority, the Greater Lafayette Chamber of Commerce, International Trade Development Group, the Council for the Development of French in Louisiana and the Cultural Association of Latinos in Acadiana also attended the event.